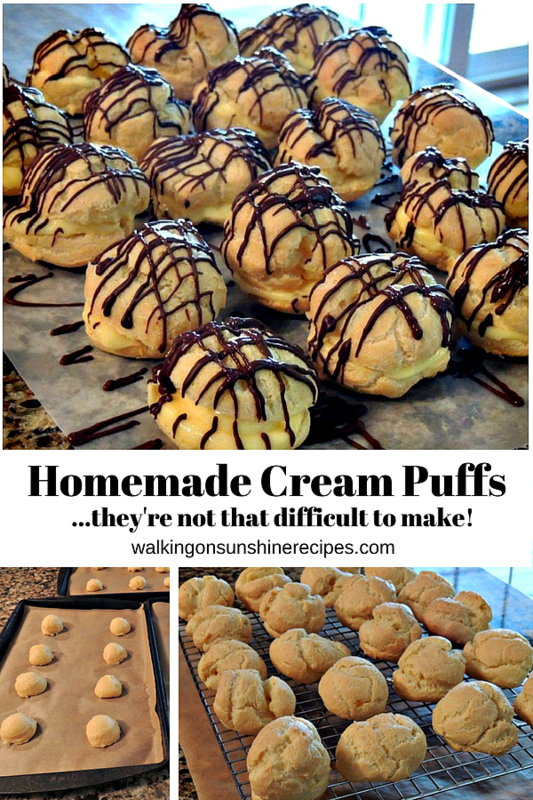 Homemade Cream Puffs – They’re Really Not that Difficult! 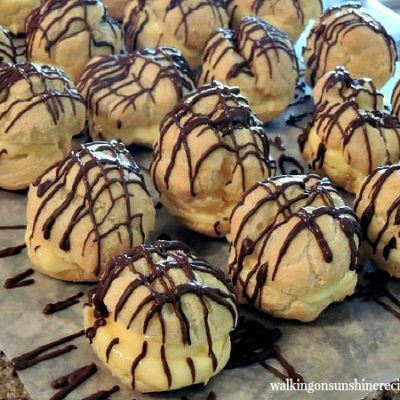 Homemade cream puffs or choux pastry is not that difficult to make when you follow my easy step-by-step recipe and instructions! This is a family favorite recipe that my mom showed me how to make years ago. Quick…name a dessert you think is difficult to make! For some people, me included, it would be Homemade Cream Puffs. Yes, I used to think cream puffs were a difficult dessert to make. We have cream puffs every Christmas and for the past few years I have started to make them! My whole family loves them…even my brother who hardly eats desserts will enjoy a cream puff on Christmas. I always thought they were difficult to make but then my mother showed me how a few years ago and I am going to show YOU how to make the most delicious dessert ever that will impress your family and friends. 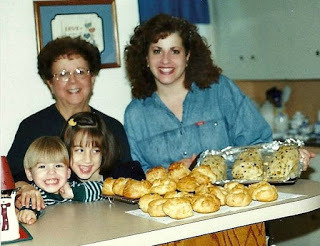 Here’s a photo from “just a few years ago” of my mom and I baking cream puffs and Christmas stollen bread. My kids are so young in this photo! This is at our home in New Jersey. So what is this mysterious dough that we love to enjoy filled with pudding, whipped cream and even savory treats? It’s real French name is choux pastry and it’s the perfect blend of butter, water, flour and eggs combined together and then baked. Sounds pretty simple, right? But for some people, the thought of preparing choux pastry is terrifying. I’m happy to tell you today that it’s not…especially if you follow these easy step-by-step photo instructions. You’ll be enjoying homemade cream puffs for your next family party! Make sure you add the eggs one at at time. This will give you a beautiful silky batter that’s ready to be either piped or scooped onto a baking sheet. After you have formed the pastry dough into balls, dampen your finger into a bowl of water and smooth out the tops of each mound of dough. 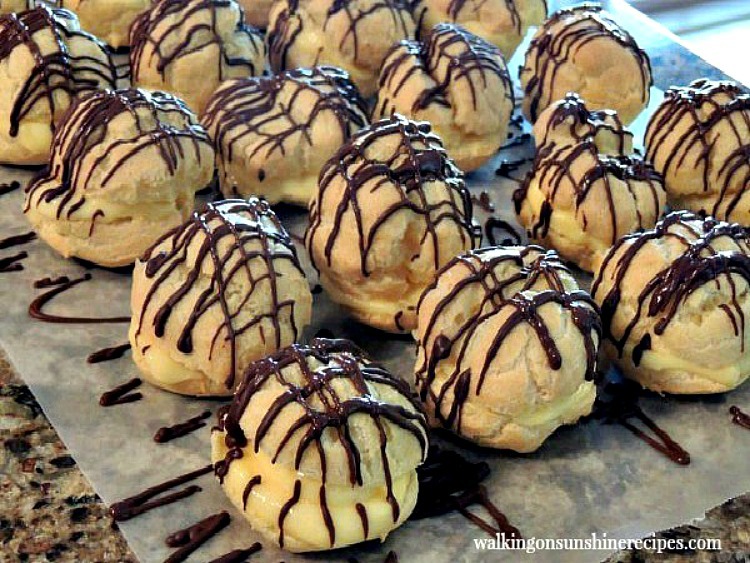 Bake the cream puffs in a 400 degree oven for 15 minutes then reduce the oven temperature and bake for an additional 30 minutes or until they are golden brown. Then pull the trays out of the oven and then using a wooden skewer poke a couple of holes into the sides of each puff. This will allow the steam inside the puffs to escape so they can dry out and bake on the inside. Return the trays back to the oven, only turn the oven off, and keep the door ajar for an additional 10 to 15 minutes. I use my metal kitchen tongs to keep the door ajar. You can prepare the cream puffs the day before you plan on serving them. But please do NOT cover them or store them in the refrigerator. They will turn soggy. I like to bake them the day before and then leave them on a baking tray with a piece of parchment paper or even a paper towel loosely covering them. 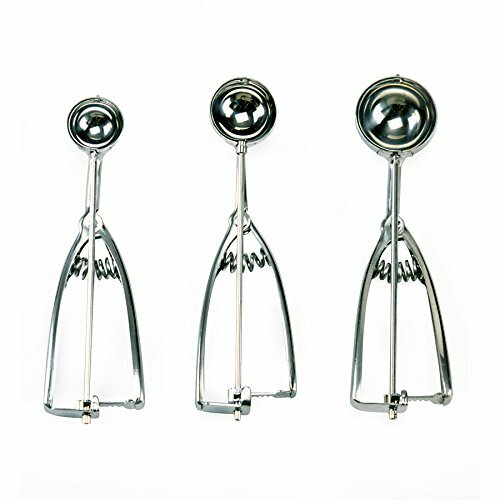 Cookie Scoops – these will help give you uniformed sized cream puffs. 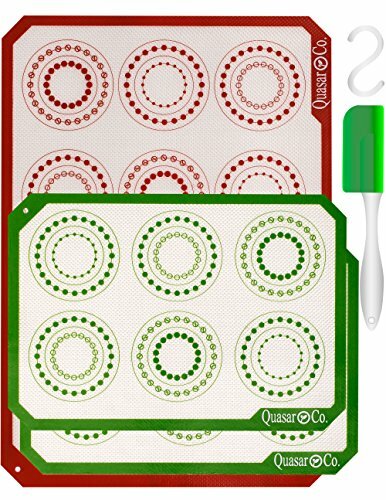 Baking Mat with Circles – this is another great tool to help you form the same size cream puffs. 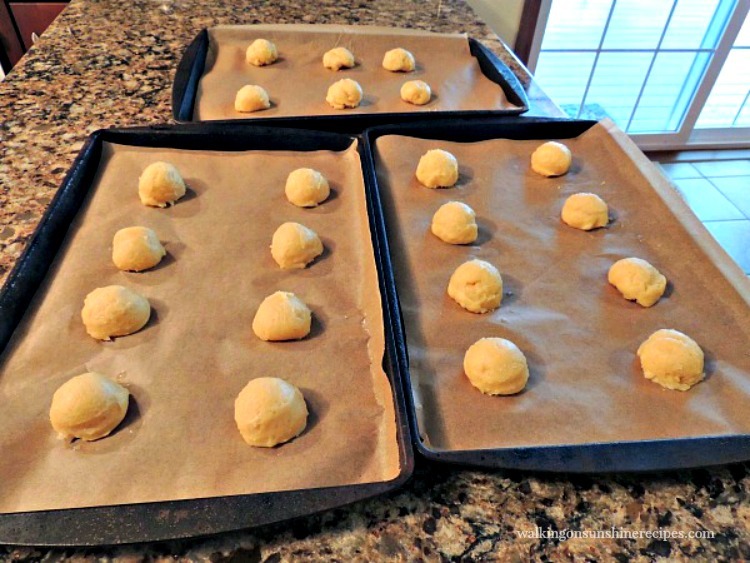 Baking Cooling Rack – allow the cream puffs to cool on a baking rack so the bottoms don’t get soggy. Chocolate Drizzle Tool – my favorite way to drizzle chocolate! In a saucepan, heat the butter, water and salt over high heat and bring to a rolling boil. Remove the pan from the heat and add the flour all at once stirring quickly until the dough comes together and forms a ball. Let the dough cool for 5 minutes. 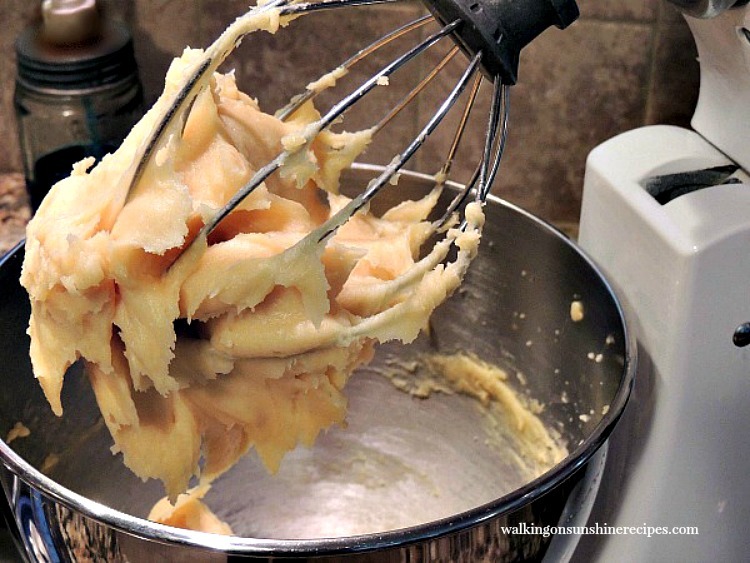 Add the dough to the bowl of an electric mixer. Or you can just use a hand mixer with the dough still in the original saucepan. Add the eggs one at a time mixing in between each addition until the dough is smooth and silky. Be careful not to over mix the dough. Scoop or spoon the dough onto cookie sheets that have been lined with parchment paper leaving enough room in between each since they will puff up. Dampen your finger slightly with water and smooth out the tops of the cream puffs. See how smooth they look in the photos below? Bake for 15 minutes in a preheated 400 degree oven. Then reduce the oven temperature to 350 degrees and bake for an additional 30 minutes or until they are golden brown. Pull the trays out of the oven and using a wooden skewer poke a couple of holes into the sides of each puff. This will allow the steam inside the puffs to escape so they can dry out and bake on the inside. 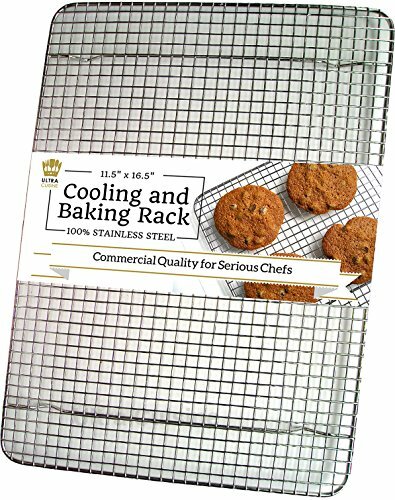 Return the trays back to the oven, only turn the oven off, and keep the door ajar for an additional 10 to 15 minutes or until they sound hollow when you tap on them. I use my metal kitchen tongs to keep the door ajar. Remove them from the baking tray to a cooling rack to cool completely before stuffing. Homemade chocolate whipped cream is a favorite. Favorite flavor of pudding – we always use vanilla and chocolate pudding. If you are going to use pudding, make sure you only use 1 3/4 cups of milk not the full 2 cups of milk that the package calls for. You want to follow the pudding pie directions on the back of the packages. Cannoli cream is another favorite. 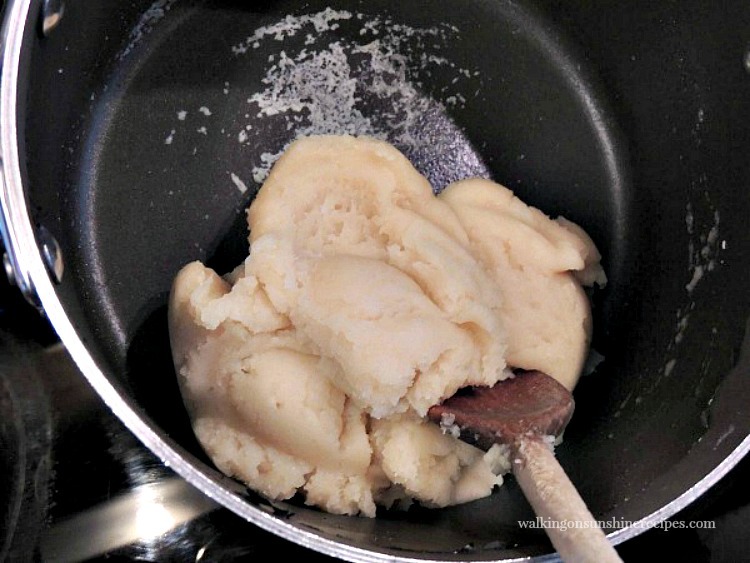 Slice the choux pastry in half using a serrated knife and then fill them with your favorite filling. You can add sliced strawberries too to the filling. Most importantly, don’t forget to drizzle with melted chocolate for a really festive look. Cream puffs are a light and delicious dessert that your guests will enjoy. 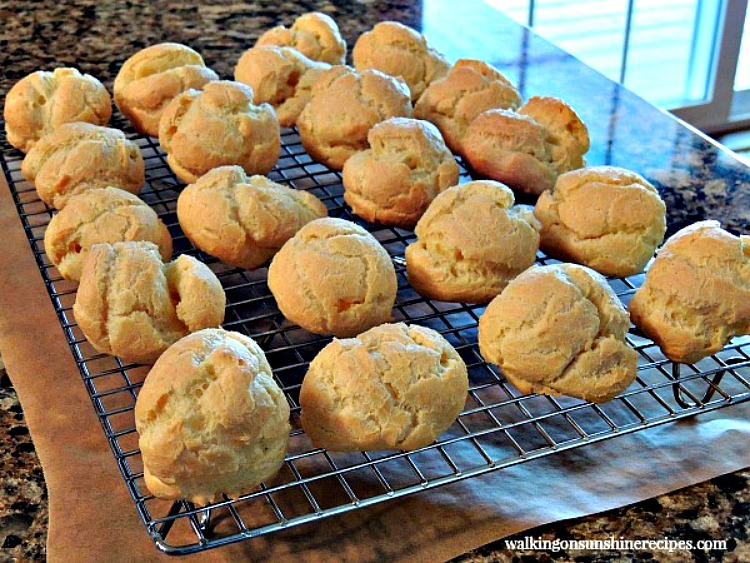 Choux pastry for Homemade Cream Puffs is not that difficult to make! 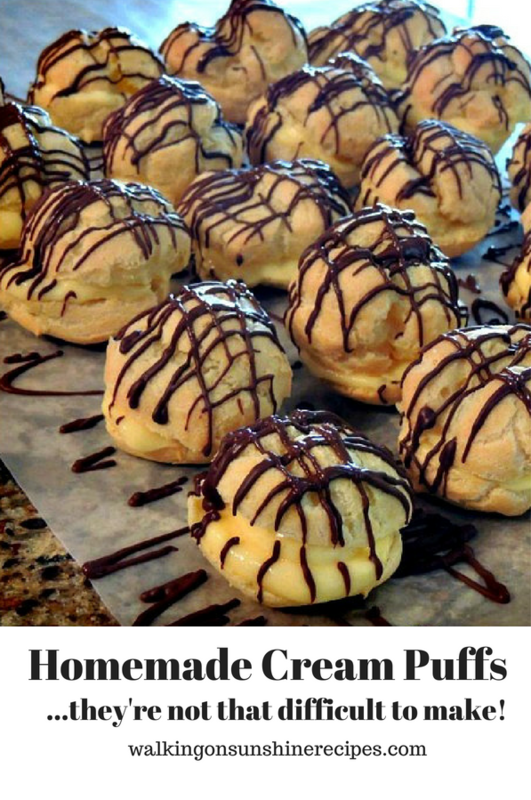 Follow this recipe and you can enjoy the most delicious cream puffs ever for dessert! Dampen your finger into a bowl of water and then smooth out the tops of each mound of dough. Let the puffs cool completely on a baking rack before filling with pudding or whipped cream. Drizzle with melted chocolate or dust with powdered sugar before serving. You can prepare the puffs the day before you plan on serving them. Store lightly covered with a piece of waxed paper or paper towel on a baking rack on the counter top. Do not refrigerate or cover completely or the puffs will become soggy. I like to slice the puffs in half and then spoon the pudding inside and placing the other half on top. You can also use a pastry bag fitted with a filling tip to add the pudding. Once the puffs are filled you should store them in the refrigerator, but do not cover. Delicious cream puffs, my family loves them. I'm going to have to jump in and try the baking mat and chocolate drizzler, hoping I'll make less of a mess. I'm a chocolate drizzle fan! Yum! Yum! Yum! Thanks for linkin' up with What's Cookin' Wednesday! 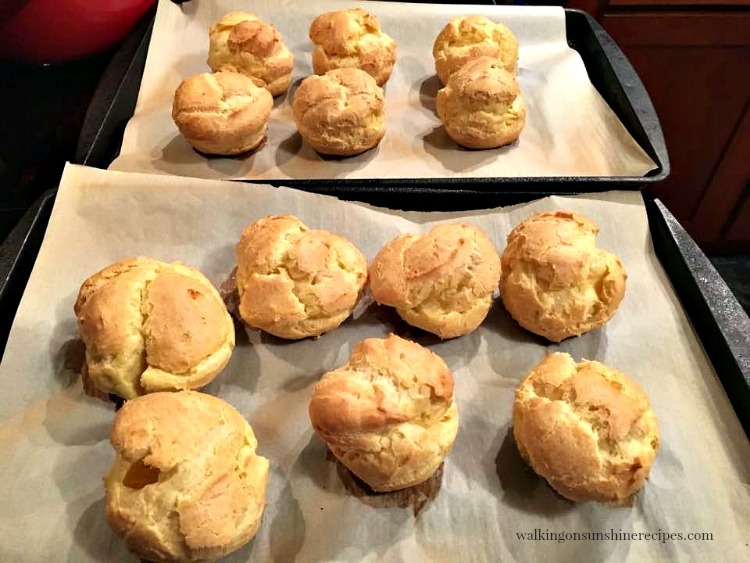 My husband loves cream puffs and often orders them on vacation but I had never thought to make my own until I saw this blog post. He would love this! Pinned. OMG!! Thanks so much for putting your recipe on pinterest. My daughter and I used a different pin and it was a complete mess 😔 But we used yours and they were perfect ❤👏 Thanks so much!!! Thanks for the recipe! This was first time making any kind of choux pastry and your recipe and instructions were easy to follow! My family loved them! Thank you for the lovely comment! Glad you enjoyed the recipe. It’s one of our favorites as well. The step for adding the eggs was left out of the recipe. I assume it is just before the flour is added? Adding the eggs is included in the printable recipe card. I will adjust the recipe photo in the post. Thank you for visiting! 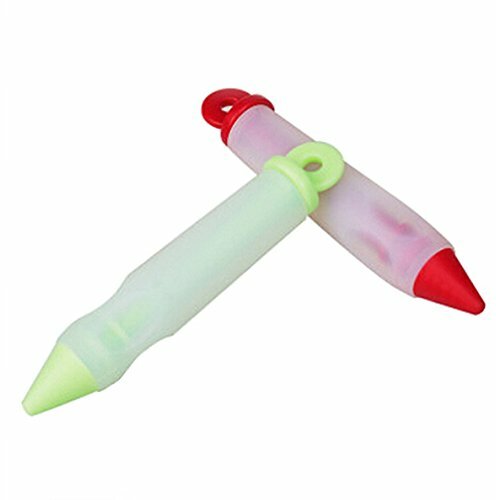 Can you just pipe the filling on from the side so as to keep the puff whole? And dip them in chocolate (just the top) rather then drizzle? That sounds delicious! Let me know how they come out for you! Thanks for visiting.